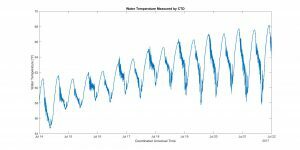 Above is a sample plot of water temperature plotted against time recieved from the CTD sensor. Conductivity, which is essentially how well electrical current can pass through the water, is directly related to the salinity of the water and using the conductivity, temperature, and the pressure one can determine the density of the water. The sensor also gives us measurements of turbidity (a measurement of the cloudiness of the water), dissolved oxygen, and the amount of chlorophyll in the water (a measure of the estuary’s health and an indicator for pollutants such as phosphorus and nitrogen). Notice how the temperature fluctuates twice per day. The temperature drops as the cold Atlantic ocean water flows into the Piscataqua on flood tides and the temperature increases as the warmer water from the Great Bay flows by the Memorial Bridge out into the ocean on ebb tides.